Little ones have a fascination with cars and wheels. Both of my boys loved to play hours on end with anything that had wheels that they could zip around the floor and the walls (especially the walls!). They were in even more awe when those same cars lit up and made noises. Knowing that little children are fascinated with the movement, noises and lights of cars, VTech designed the Go! Go! Smart Wheels collection that helps children learn about the world around them while feeding their desire to play with cars that move and make noise. The collection of vehicles sing songs and can even zoom off on their own with the touch of the button. The Go! Go! 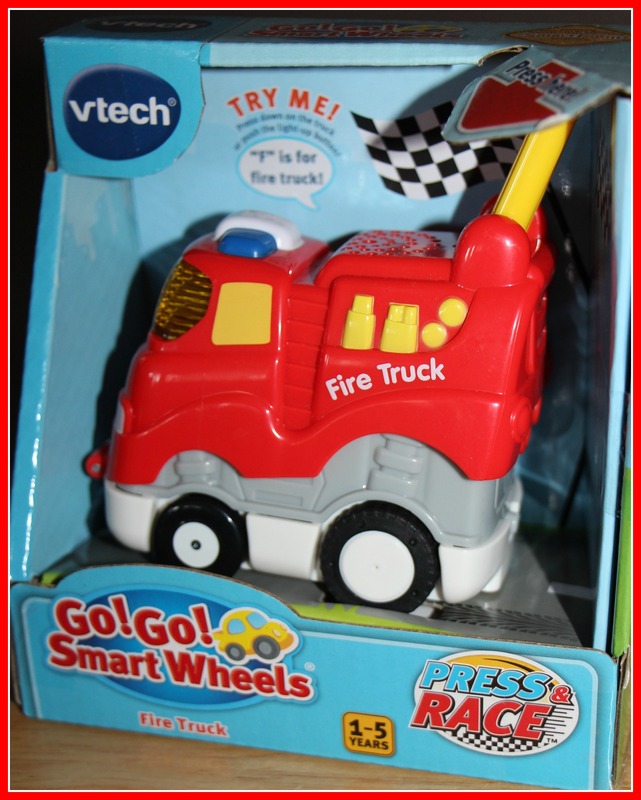 Smart Wheels Press and Race Fire Truck helps your child explore the world of fire safety and emergency response. Many children want to learn more about these trucks and the heroes that are aboard, and what better way to introduce them to their heroes than through play. Children can learn about firefighting, the letter ‘F’ and even perform their own rescues with their own fire truck. 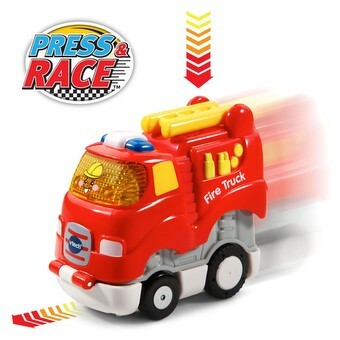 With the press of a button, their fire truck is quickly off to the rescue and your little one becomes the hero in an important rescue mission. The fire truck fits perfectly into your child’s hand and is geared to children aged 1 to 5. The fire truck will also respond to Smart Point locations on Go! Go! Smart Wheels playsets and Go! Go! Animals tracks, which is a definite win-win in my mind. The Go! Go! Smart Wheels Press and Race Race Car introduces your child to life in the fast lane – in a fun way! This tiny but powerful race car lights up, sings songs and helps your child learn about the letter ‘R’ – you can even add in fun sound effects. Press, hold and let go and your race car is off to win the championship! This race car is the perfect gift for the child in your life that loves to be on the move and make cars zoom fast. 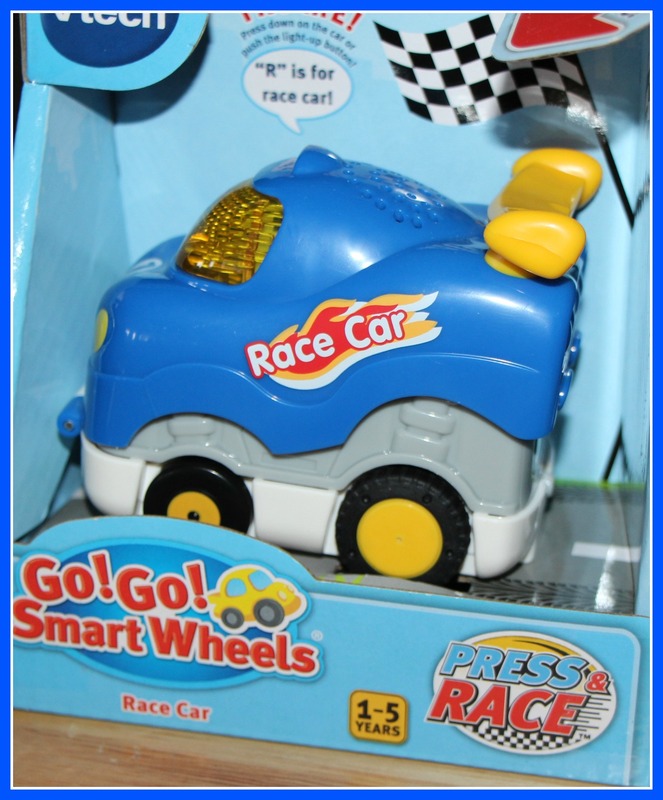 Like the Fire Truck, the Race Car also responds to Smart Points on Go! Go! Smart Wheels playsets and Go! Go! Animals tracks. The Go! Go! Smart Wheels collection also includes a dump truck, runway airplane and a trot and travel royal carriage. All of these VTech products can be purchased at Toys R Us or Walmart. Make sure to follow VTech on Facebook and Twitter to keep up to date with all the latest news and products for your little one. Disclosure: I received the above products in order to facilitate this review. All opinions expressed are my own. This entry was posted in children, gifts for kids, review.